“Livable Streets has arrived as a political force,” tweeted NYC Deputy Mayor Howard Wolfson the morning after last week’s all-important primary election. StreetsPAC — a political action committee formed earlier this year to strengthen local candidates who support policies that improve walking, biking and transit — endorsed the winner in 13 of the 18 City Council races in which it was active, and might pick up another victory pending the results of a recount. In New York, which tilts heavily Democratic, primaries are where most City Council races are decided. StreetsPAC-endorsed candidates won several contested open seats, and in one much-watched election ousted a sitting City Council member — a rare feat. Even StreetsPAC organizers (disclosure: Streetsblog founding editor Aaron Naparstek was active in forming StreetsPAC) were somewhat surprised at the results, said Steve Vaccaro, a board member and founder. 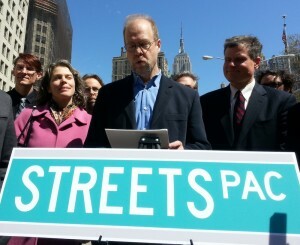 When StreetsPAC was founded, its members wanted to ensure the new mayor wouldn’t undo the progress made by Mayor Michael Bloomberg and Transportation Commissioner Janette Sadik-Khan, who introduced measures like protected bike lanes, Select Bus Service, pedestrian plazas carved from traffic lanes, and the city’s successful bike-share system. A reversal doesn’t seem likely anymore. With opinion polls consistently showing that the public supports these changes, “ripping out bike lanes” clearly wasn’t going to be a winning message. Part of what tipped StreetsPAC toward the eventual Democratic mayoral primary winner, Bill de Blasio, was his campaign promise to aim for zero pedestrian deaths if elected. The races where StreetsPAC primarily focused were the City Council elections, in which a few hundred votes can make all the difference. In New York, as in many other cities, council members play a large role in determining whether street redesigns move forward. StreetsPAC’s advantage comes from the grassroots enthusiasm for the policies it promotes. Rather than spend on TV spots or mailers, it focused on digital communications and face-to-face outreach. Its email newsletters reach about 1,500 people, while the group believes its social media messages and endorsements are watched by a larger audience that’s tougher to quantify. StreetsPAC also helped recruit volunteers for its chosen candidates and hit the streets to get the word out about its endorsements. After selecting its candidates, StreetsPAC volunteers reached out to New Yorkers with a lot at stake in the changes enacted by Bloomberg and Sadik-Khan, encouraging them to vote for StreetsPAC’s roster. They approached cyclists in places where they gather. They approached people enjoying the city’s new pedestrian plazas. It was the pac symbol that delivered legitimacy, but it was the echo chamber of this blog that actually mobilized streetsfolk.